But Yablon, who recently won teaching honors at UW-Madison, is in on the joke. He wants law students to begin viewing themselves as legal thinkers in their own right. By prompting them to consider more than one possible answer, he hopes they learn to question the assumptions they bring into his classroom. Prof. 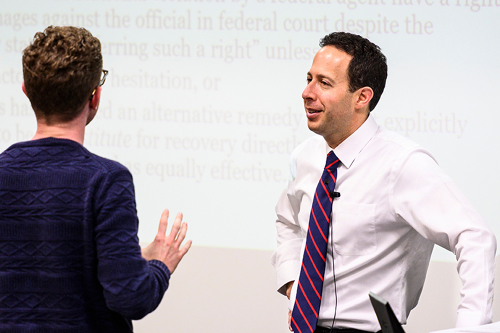 Rob Yablon talks with a student in his federal jurisdiction class. That dedication to advancing learning has earned Yablon admiration from his students and colleagues, and campus accolades for his teaching. In April, he will be one of ten educators to receive a 2019 Distinguished Teaching Award from UW-Madison; and just last year, UW Law students named him Classroom Teacher of the Year. Yablon teaches two large core classes at UW Law, Civil Procedure and Federal Jurisdiction, along with a popular elective called Law of Democracy. His research interests include political and election law, constitutional law, federal courts and statutory interpretation. In course evaluations, students praise Yablon’s knowledge of course subject matter, his use of humor in the classroom, and his ability to convey difficult concepts clearly. He is consistently commended for his kindness. The university has presented its Distinguished Teaching Awards annually since 1953 to recognize its finest educators. Besides Yablon, seven other Law School professors have received the honor, including Miriam Seifter (2018); Alta Charo (2014); Howard Erlanger (2004, 1993); Jane Schacter (1998); John Kidwell (1992); Kenneth Davis (1990); and William Church (1985). Chancellor Rebecca Blank and Provost Sarah Mangelsdorf will present the awards at 5 p.m. April 10 at the Pyle Center. The ceremony is free and open to the public.